Do you know there are many dangers on Internet? I think majority of us know about this. If you don’t be careful, you might suffer financial lose, identity theft or need to reformat your hacked computer after connecting your computer to Internet. This spyware threat is very common! Your computer can be easily infected with spyware if it’s connected to Internet. Spyware can get into your computer when you install plugins or freeware that’s bundled with spyware, and your computer is particular easy to get infected when you access to online gambling, hacking, pornographic or freeware websites. The spyware will collect your website surfing habits, online buying activity or other personal information, subsequently you might receive many annoying pop-up advertisements that is based on collected data from your online habit. In worst case scenario, your computer is compromised and used as a base to hack other computers. To learn more, here is detailed definition of spyware. Your computer can be easily infected with computer worm or virus after connecting to internet if the computer OS (Microsoft Windows, Mac OS, Linux, etc) is not updated frequently or the other software is not patched when there is new program update. Worm is self-replicating program and it utilizes network to replicate and compromise those vulnerable computers, after that installs backdoor program and uses those computers as zombie computers to attack other computers. As for computer virus, it usually attaches to an executable file (received via email, instant messaging, WWW, CD, etc) and damages your computer system when you run that executable file. Phishing scam is a deception used on Internet to steal online user’s valuable credit card numbers, social security numbers, online banking password, email password and other important private information after compromising the user's computer, that’s why you need to pay attention on this type of scam. Nowadays it's also common for compromising user's computer with ransomware via phishing email attack. In this situation you won't be able to access the computer as the computer data has been encrypted by ransomware until you have paid the ransom. 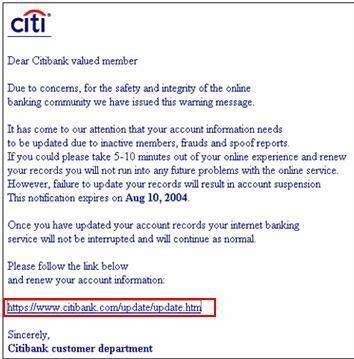 - Official-looking email from your favorite banks to request you to change online banking password or update personal data by following a spoofed website link. - Message received in MSN, Yahoo or other instant messengers to prompt you changing password due to some ad-hoc situations. - Fake online advertisement that leads users to spoofed website. - Affected by pornographic, violence, drugs or other inappropriate websites. - Approached by strangers via social media (Facebook, twitter, etc), instant messenger or email. - Disclosure of personal information online that leads to identity theft. - Threatened, harassed or humiliated by other kids (usually we call this cyberbullying). After talking about all these dangers on Internet, let’s check out these Internet safety tips to tackle the problems. Return to top of "Beware of Dangers on Internet"! !